Tree harvesting is not the goal of the management at Sparta Mountain WMA, but a tool used to achieve the goal of improving forest habitats. In these harvests, we retain the best trees to provide a seed source to grow new trees. We also keep or "reserve" individual trees known to have wildlife value, such as shagbark hickory for bat roosting. When managing more than 10 acres with a seed tree harvest, an average of 30% of the canopy is retained. For small projects less than five acres, we retain about 10% of the canopy. In this harvest method, the malformed and suppressed trees are removed, to leave about half the canopy. New trees regenerate under the canopy. Approximately 10-15 years after the initial harvest, the overstory trees may be removed to allow the new trees in the understory to mature. In this method, foresters choose single trees to be removed. The trees we keep are the healthiest of the stand and trees we choose to remove are less desirable—usually the suppressed, insect infested, hazardous trees or trees that have poor structural quality. The goal is to create a diverse forest stand with multiple tree ages and sizes. This method is low-intensity over a large area. This will improve the vigor of retained trees and allow more light to reach the forest floor. Some tree and shrub species that are valuable to wildlife can only regenerate in full sun. To foster the growth of these plant species, we create small openings of less than an acre that mimic natural damage caused by snow or wind storms. We also keep or "reserve" individual trees known to have wildlife value, such as shagbark hickory for bat roosting. We use this method in Sparta Mountain WMA where the forest has been impacted by the invasive insect hemlock woolly adelgid. 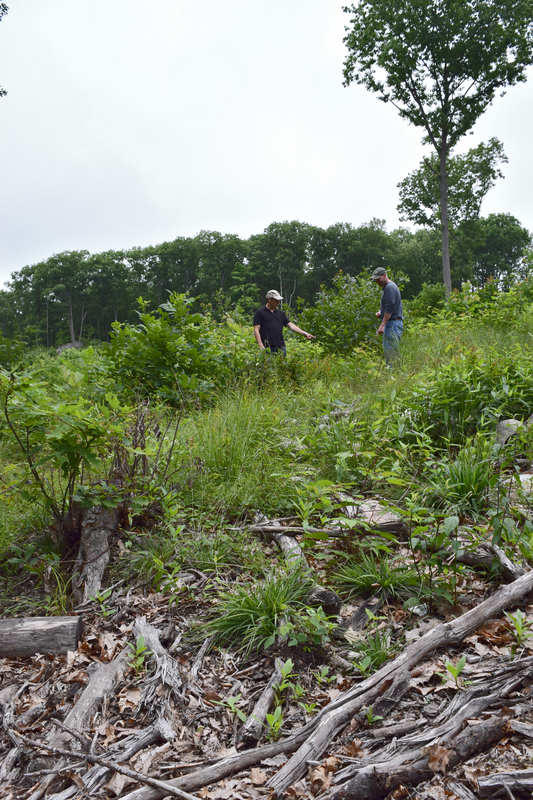 Please note, while clearcutting is a method used for harvesting, there will be no clearcuts at Sparta Mountain WMA. What happens to the cut trees? Depending on the species and quality, three things might happen to the cut trees. 1. A contractor might pay us for the trees. These trees will be taken off-site to be turned into lumber, wood pulp, wood chips, and other wood products—products we use every day. 2. Some cut trees stay on-site to deter deer and to decompose back into the soil. 3. Sometimes the trees cut don’t have much market value but need to be removed so the new trees and shrubs have room to grow. In this case, DEP will pay a contractor to remove the cut material. What are you doing with the profit from selling logs? We put any profit towards the many other parts of this project that need funding such as herbicide applications for invasive plants, surveys for endangered plants, water quality testing, and management plan revisions. What are you doing with the excess money after you pay for other activities at Sparta? There is no excess money; the sale of logs only offsets a small portion of the entire project’s cost. New Jersey Audubon Society and NJ DEP are the organizations that fund this management plan with the goal of improving the forest habitat.